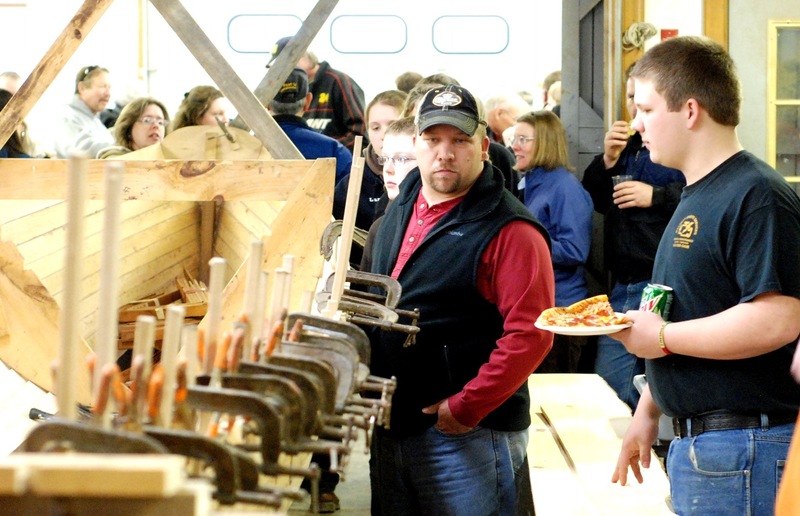 Wednesday, March 23 was Parents’ Night at the LCMM Boat Shop. Since January, students from the Diversified Occupations (D.O.) 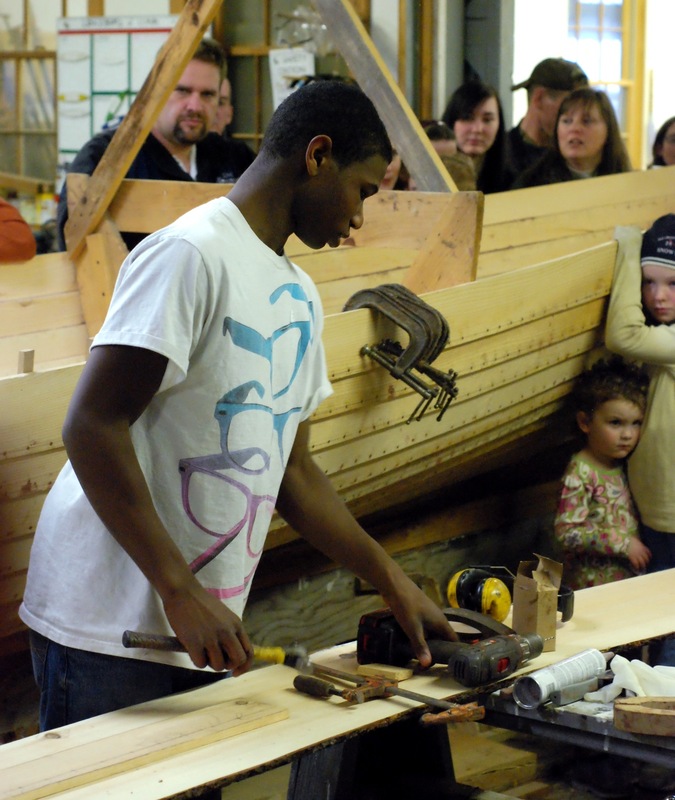 program at Middlebury’s Hannaford Career Center have been hard at work building a 32′ pilot gig at LCMM’s Boat Shop four days a week – it’s all part of LCMM’s Champlain Longboats program. On Wednesday, after a hard day’s work, the Diversified Occupations (D.O.) students came back out to the boat shop once more, accompanied by their parents, siblings, aunts, uncles, grandparents, and friends. Everyone, guests and boat builders alike, were invited to enjoy pizza and soft drinks before the real fun began. Standing up in front of over 75 family members and guests, each student proceeded to explain the different aspects of building a 32’ Pilot Gig, using the knowledge and skills they had learned from the building process thus far. 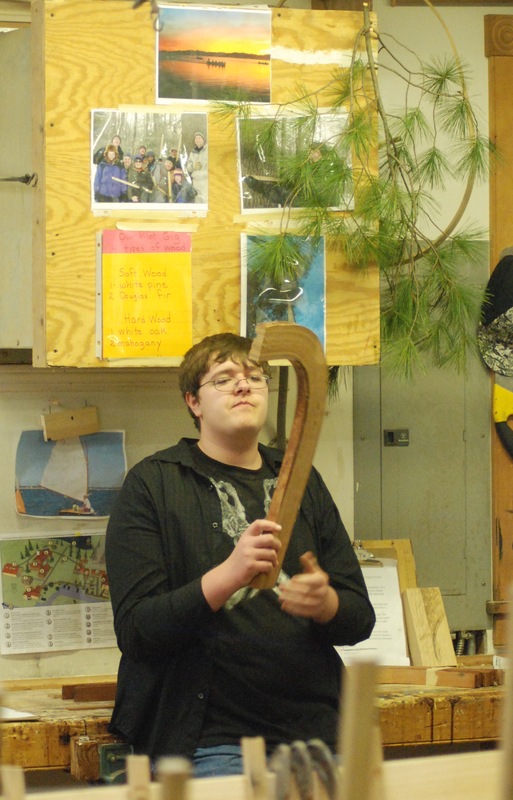 Each student had an area of expertise that they explained to the audience: parts of the boat and their names, which wood was used in the construction and why, clench nailing, making a scarf joint and its function, making a gain and its function, and rowing around Lake Champlain. In the final station, which involved all of the students and teachers, freshly steamed ribs were installed in the pilot gig – with narration so guests could understand what steps they were observing. Following the presentations, guests were able to wander the boat shop, ask questions, and observe pictures of the D.O. students that had been taken during work days. As the evening drew to a close, parents and students headed home and the boat shop grew quiet but only for the night, as the students returned the next morning for another day of work on the Pilot Gig. “At pizza night I talked about four different types of wood and how it is used on the pilot gig. I told them about the wood lot where we went to learn about how old a tree is. When I didn’t know the answer to a question I asked the other boat building students.” –Matt Montgomery.